A Hardee Corps design flag that General Patrick Cleburne's troops used (Blue field with white border and white moon in center), with the Cleburne County government seal (Blue ring "CLEBURNE COUNTY ALABAMA" around white circle containing 2 mountains, road and six trees) in the middle - filling the void of the white moon. Back in March 2003, after the closing ceremonies of the 2nd annual Cleburne Day, I was returning to my car when I happened past a white Cleburne County truck that had a circular logo on the door. 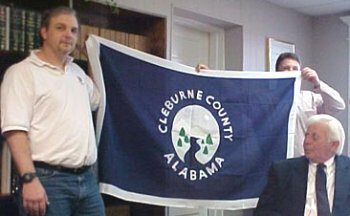 The logo was a blue ring with the words "Cleburne County Alabama" written in white, surrounding a white circle in which were depicted two mountains, a sun, a river, and six pine trees. Instantly I pictured the Hardee Corps Battle Flag, under which General Patrick Cleburne fought and gave his life, and whose memory we had just finished honoring. Wouldn't the logo fit perfectly and look great as part of a County Flag? I thought to myself. I asked a passing dignitary if in fact the county did have a flag, and to my pleasant surprise found out there was no such banner. I did mention to him that the county logo would make a perfect addition to the Hardee Corps Battle flag and make a beautiful county flag, and while he nodded in acknowledgement, I doubt he understood what I was talking about. It wasn't until December 2003 that I received info on the 3rd annual Cleburne Day, and that it would be the 140th anniversary of the General's untimely death. I was included in a planning session email, and gave suggestions for a parade, and reiterated my flag proposal to the group. My idea was simple. Take the Hardee Corps design flag that General Patrick Cleburne's troops used (Blue field with white border and white moon in center), and place the Cleburne County government seal (Blue ring "CLEBURNE COUNTY ALABAMA" around white circle containing 2 mountains, road and six trees) in the middle - which would take the place of, or fill the void of the white moon. In January 2005 I secured a Hardee Battle flag from Mr. Richard Boarts, and commissioned artist Mr. Dustin Compton, a fellow employee and Roopville resident, to hand paint the logo over the moon. He completed the task in early February, and the results were fantastic. The flag was presented to the full commission on March 14th, 2005, and was UNANIMOUSLY adopted at approx 6:20pm CST. There was a ceremony on the courthouse grounds on Cleburne day, the 19th of March to introduce it to the public. Here's to you, General Cleburne, and your brave men! Long may we remember your efforts and sacrifices!